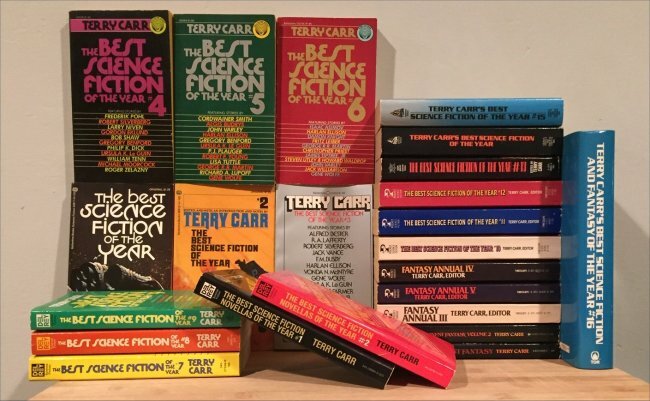 After his exit from Ace, Terry Carr launched his own Best Science Fiction of the Year series with Ballantine, then the leading paperback publisher, in 1972. Throughout the '70s especially, "this series was generally regarded as the best of the annual compilations" (SFE), with more selections of stories that have gone on to become standards and classics in the field than those in Wollheim's contemporaneous series, though by the early 1980s Dozois' huge volumes had the advantage. Carr's SF series expanded with two separate volumes devoted to novellas at Del Rey, before moving to Pocket Books, then Baen for one volume, and then to Tor for the final three volumes, the very last appearing in hardcover. Meanwhile, Carr did a fantasy series for Berkley for two volumes and then Pocket for three volumes, with varied titles. Carr's introductions were casual, often about the process of assembling anthologies. He revived Judith Merril's practice of listing honorable mentions at the end of the book. Beginning with Volume 4, summaries of "The Science Fiction Year" were provided by Locus editor Charles N. Brown, in a format adopted and greatly expanded by Gardner Dozois in his annuals, and in a manner that continues in Locus Magazine to this day.